"Hey, dude, you're setting my horse's foot on fire!" Trainer Bob Baffert watched closely as Tom Doolan hot-seated Pioneerof the Nile's feet before the Kentucky Derby on Saturday. The horse finished second. For a bigger view of this photo, double-click on the image. Needless to say, this is a story that racing fans would read only on the Hoof Blog. Bob Baffert must have been holding his breath Saturday morning as he watched horseshoer Tom Doolan hotseating Pioneerof the Nile's hooves before nailing on new shoes for the Kentucky Derby. In case you are not familiar with this process: "Hot seating" is as old as the hills...or maybe older, but you don't see it much around the racetrack anymore. When pleasure horses are shod with heavier steel shoes, the shoes are still heated in a forge and shaped and reflattened to fit the foot. Then, before nailing on, the hot shoe is held against the trimmed foot to make sure that the foot is trimmed flat and that the shoe has been hammered flat and that everything is where the shoer wants it. Along the way, some shoers notice that the feet that are "burnt on" tended to be healthier and there are actually some studies going on to see what is the optimum time to hold the hot shoe against the foot. You can't heat up an aluminum race plate so Baffert's farrier, Massachusetts native Tom Doolan, used Dan Burke's forge to heat a steel shoe to use for the hot seating of Pioneerof the Nile's feet, then he just nailed on the cold aluminum plate. Hot seating or fitting also causes a loud sizzle and then releases a plume of sulfurous smoke that has a special way of clinging to your hair and clothes: it's all very medieval and magical the first time you witness it! Bob Baffert has been around long enough to have witnessed it many times, but the sheriff's deputies and security guards who crowded around probably wondered why people wrinkled their noses at them the rest of the day. Many shoers believe that a foot that has been hot-seated also holds a shoe better and that the process somehow seals the horn tubules and helps keep bacteria out of the hoof wall. Saturday's wet track conditions may have inspired Doolan, or weakened Baffert's resistance to allowing his very valuable horse's feet to be set almost set afire a few hours before the race. Or, it may have been Baffert's idea in the first place when he saw the weather report. 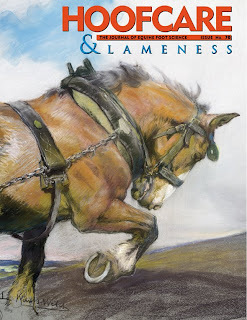 Note: Hot seating has nothing to do with any sort of a lameness condition; it is routinely done on sound horses perhaps even more often than on lame horses. There is no indication at all that anything is wrong with Pioneerof the Nile's feet, although we can't see his feet through the flames! They say the Kentucky Derby is all about tradition, and this little ancient backstretch ritual certainly proved that. 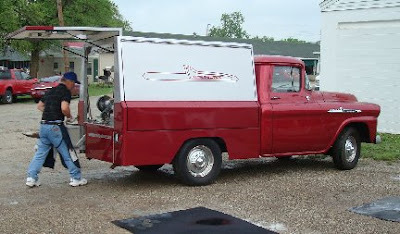 Tom Broadus worked out of the Farrier Product Distribution vintage Chevrolet pickup with its state-of-the-art Stonewell farrier box body to prepare shoes for Papa Clem on Derby morning. The fully-equipped classic rig was parked at Churchill Downs for the week in case any of the visiting shoers needed help. Thanks to Dan Burke for the photos! Yup, my Noble has had that done on occasion and it does stink! Heard from a client, a bio-chemist to boot, when hot fitting her horse. "I love the smell of burning protein". Fran, I learn the koolest stuff from reading your blog!